I was totally lost for dinner ideas last week. I had an abundance of quinoa but that was about it. A trip to the store and a few canned goods later, I had an idea. I was going to make some kind of Mexican quinoa casserole. It was great! You’ll have to forgive the loose measurements below, as I was wingin’ it. In saucepan, combine 3/4 cup dry quinoa, 1/4 t salt and 1.5 C. water. Bring to a boil then cover and reduce to a simmer for 18-20 minutes. Fluff with a fork. 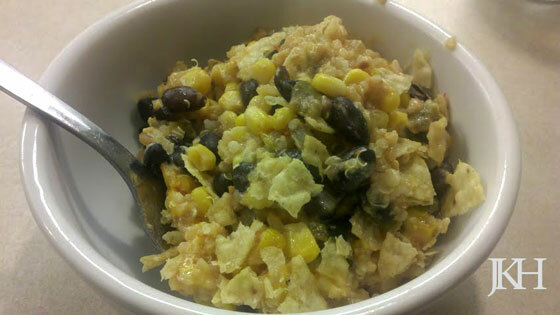 In a medium mixing bowl, combine all ingredients. Stir well to make sure everything is incorporated. Pour into greased casserole dish. Bake for 30-35 minutes or until golden brown on top. I kicked the oven up to 375 for the last 5 minutes because I was getting impatient. 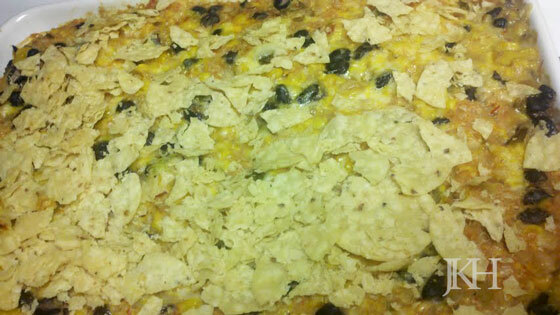 *Optional, top with crumbled tortilla chips. Enjoy!